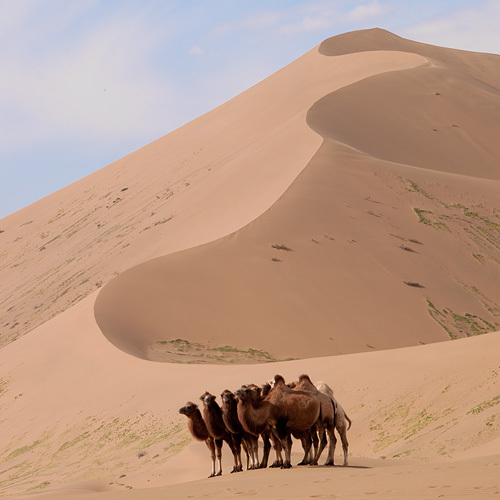 Having travelled to Badain Jarain desert, Inner Mongolia, China twice, I find that photographing in a desert is a very challenging undertaking that stretches rules and approaches we take for granted and automatically rely upon in other types of landscape photography. The challenges are multitudinous, and I thought that it might be of interest to some photographers to briefly consider the most formidable ones. To begin with, photographing in a desert is very challenging physically. Any desert is a grand place, and it really comes home to you only when you start moving around in one. To get a noticeable change in perspective you have to change your position much more than when photographing landscapes of lesser grandeur, which is not easy—walking in sand is more strenuous than on a hard surface and, to add assault to injury, Badain Jarain is a very hilly desert. Temperature differences between day and night are quite considerable and you have to carry extra clothing in the field. Add to that water, snacks and other miscellany and your load ends up markedly heavier than just the gear alone. Where you would normally run around checking out various perspectives and possible compositions, in a desert you tend to think twice before you go looking what is behind this hill or that slope, or how the perspective would change if you go up or down a little bit. Personally, I am absolutely fascinated by the notion of desert in general and sand in particular. The idea of having myriads of discrete yet evenly sized, immaculately clean and incorruptible particles that somehow have a common will and ideology seems exceedingly neat, or even theological. But the practical downside of this phenomenon is that sand particles invariably invade your photographic equipment regardless of how desperately you try to protect it. While you can take some measures such as using several camera bodies so that you do not have to change lenses, or using protective plastic bags, etc., I found that such measures are negated by the inconvenience that they impose. I ended up giving in to the pervasiveness of sand and deciding to clean my gear after leaving the desert. Finding compelling compositions in a desert is unusually difficult, because you do not have the abundance of pictorial elements that you can normally employ in other types of landscape photography. Indeed, the only physical ingredients that you have at your disposal are the sand and the sky, and thus you have to heavily rely on more intangible elements such as lines, shapes, patterns, tonal gradations, etc. As a result, you invariably turn—or, at least, try doing so—to abstract photography, because photographing a desert in a documentary fashion quickly becomes a monotonous and repetitive exercise. And as you know, abstract photography requires rich imagination and is not one of the easiest genres. 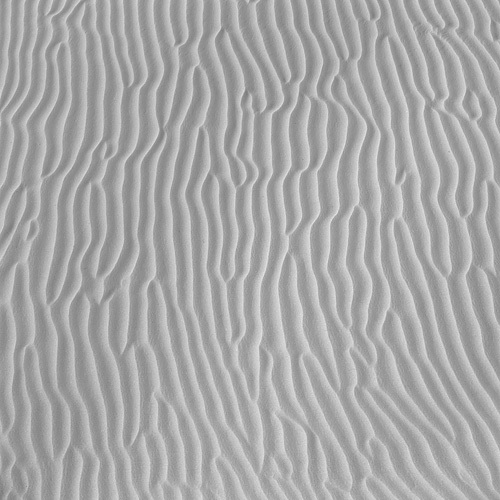 Light has unique and often strange qualities in a desert, too. In other types of landscape photography we most often photograph in the first and the last hour of the day while the light is soft and warm. This principle works in deserts, too, but not nearly as often. Early light can give sand dunes an unhealthy, heavy, brownish rendition, which I do not find particularly attractive. At the same time, midday light that we usually regard as harsh and unappealing can give the same dunes very subtle, light–coloured, almost ethereal rendering. And naturally, this can be further complicated or enhanced by varying atmospheric conditions. All things considered, you cannot just follow the usual rules—you have to critically assess ambient light in an unbiased manner at any time of the day. Although photographing in a desert might seem quite predictable, you have to look out for any unusual elements and visual effects that might make an unexpected appearance—for example, a herd of camels coming out of the blue to have a group portrait taken without a prior arrangement (the picture above was actually taken on my first trip to Badain Jarain—I overlooked it at the time but it made me smile when I looked at it again yesterday; I reckon the camels somehow knew that I was using a 39MP digital back and simply could not pass up the opportunity of getting a high resolution family portrait). In short, photographing in a desert can be challenging, rule stretching or even frustrating; nonetheless, if you keep in mind the above points and maintain a flexible attitude, it is more than likely to offer a great learning experience and be a lot of fun!